Ken Slone stands in the Christian Appalachian Project warehouse stocked with low-carb diet food near Paintsville, Ky., on March 30. 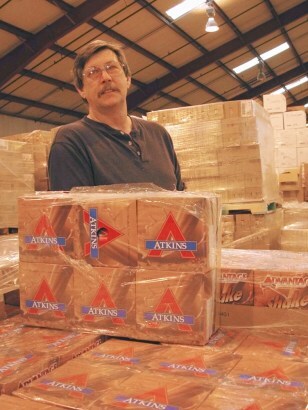 Since September, the charity has received 14 truckloads of food from Atkins Nutritionals, the New York company famous for the low-carb diet. Slone said each truck load contained about 1,300 cases of energy bars, shakes and breakfast mixes that are being distributed to churches and other organizations that minister to the needy.